Do You Remember Sitting Down To Dinner At Your Grandmother's House? 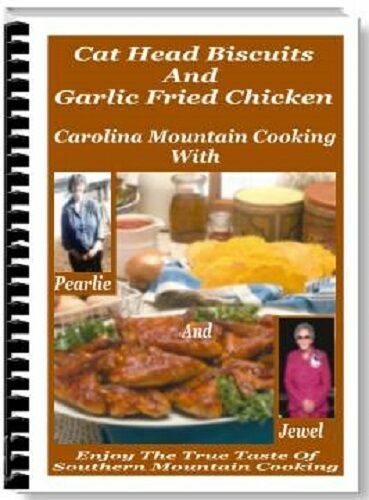 "Cat Head Biscuits And Garlic Fried Chicken" Carolina Mountain Cooking With Parlie And Jewel "The Taste Of Traditional Southern Mountain Cooking" Our highly acclaimed, best selling signature cookbook contains 125 pages, 180 hand picked, family tried and tested, real southern recipes. This Is Real Country Cooking! Just imagine sitting down to a big ol' plate of Garlic Fried Chicken, Pork Loin And Gravy, Creamy Chicken And Biscuits, or a delicious Barbecued Chuck Roast. How about home baked breads like Whipping Cream Biscuits, Molasses Oatmeal Bread, real Southern Cornbread, or a big plate of fresh, hot Cat Head Biscuits? Let's not forget vegetables and side dishes such as Mamma's Young Peas And Potatoes In White Gravy, Fried Green Onions, Golden Baked Potatoes, Fried or Scalloped Corn, Nine Day Slaw, and maybe even a big ol' pot of Potato Dumplings. And now for dessert: Oh my, the desserts! If there's one thing that southern cooks excel at, it's incredible homemade desserts! Do you remember the delicious cakes, pies, and cobblers that your mother and grandmother used to make? Cakes like Nanny’s Homemade Chocolate Cake with real Chocolate Fudge Frosting, Grandma’s Spice Cake, a Coconut Black Walnut Cake, or an old fashioned Applesauce Cake. And fresh baked pies and cobblers like Buttermilk, Chess, or an incredible Vinegar Pie. Or maybe a Creamy Pumpkin Pie, Brown Sugar Pie, or any number of fresh fruit cobblers like Blackberry, Blueberry, or Strawberry. Have you ever had Peach, Blueberry, or Strawberry Dumplings? These are so good they will almost make a grown man cry. Do you remember waking up to fresh, hot "Cat Head Biscuits" smothered in real Southern Chocolate Gravy? This is a child's and chocolate lover's dream come true! Wouldn't It Be Wonderful To Gather Your Family And Friends Around A Table Spread With Delicious Home Cooked Meals? "Cat Head Biscuits" - 180 hand picked, family tried and tested, real southern recipes. Everything from traditional meat and vegetable dishes to homemade desserts so good, they will almost make a grown man cry.